Our client, the Pennsylvania Housing Finance Agency (PHFA), won a gold 2018 MarCom Award! The MarCom Awards honor excellence in marketing and communication, recognizing the creativity, hard work, and generosity of industry professionals. The annual awards have evolved into one of the largest, most respected competitions in the world. 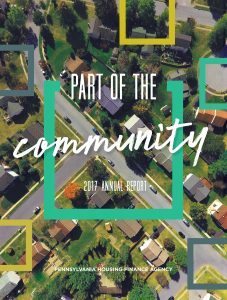 Each year since 2004, approximately 6,000 print and digital entries are submitted from dozens of countries, and we’re proud that PHFA’s 2017 annual report, “Part of the Community,” was recognized in such an esteemed competition. For several years, Graphcom has partnered with PHFA to conceptualize, design, print, and mail the annual reports to more than 2,500 recipients including state legislators and government officials. This is the third MarCom award Graphcom and PHFA been received for annual reports. In addition, “Part of the Community” was awarded a 2018 Platinum Hermes Creative Award. We’ve also received American Advertising Awards from the American Advertising Federation and Davey Awards for previous PHFA annual reports. PHFA provides the capital for decent, safe, and affordable homes and apartments for older adults, persons of modest means, and those with special housing needs. Since its creation by the Pennsylvania state legislature in 1972, PHFA has generated $14.1 billion of funding for more than 175,000 single-family home mortgage loans and 134,507 rental units, while saving the homes of more than 49,500 Pennsylvania families from foreclosure. Put your next annual report in print. From design to printing to distribution, we can support it all. Contact us today to get started.